Exclusively from the Rows of Throws® collection comes the premium, fleece 50" x 60" Always Remember You Are Braver throw blanket. Let her know you are thinking of her. Help inspire and comfort a close friend or relative who's a breast cancer patient and survivor or if they're just going through a difficult time. Besides being a delightful, get well soon gift, this soft fleece throw makes a unique, pink accented addition to her bedroom, door room or as the lead in a women's care package. UNIQUE & MEANINGFUL: 100% polyester 50" x 60" grey plush throw blanket features a timeless positive words message GIFT READY: Comes wrapped with a white satin ribbon bow as pictured. Saving you money and time. 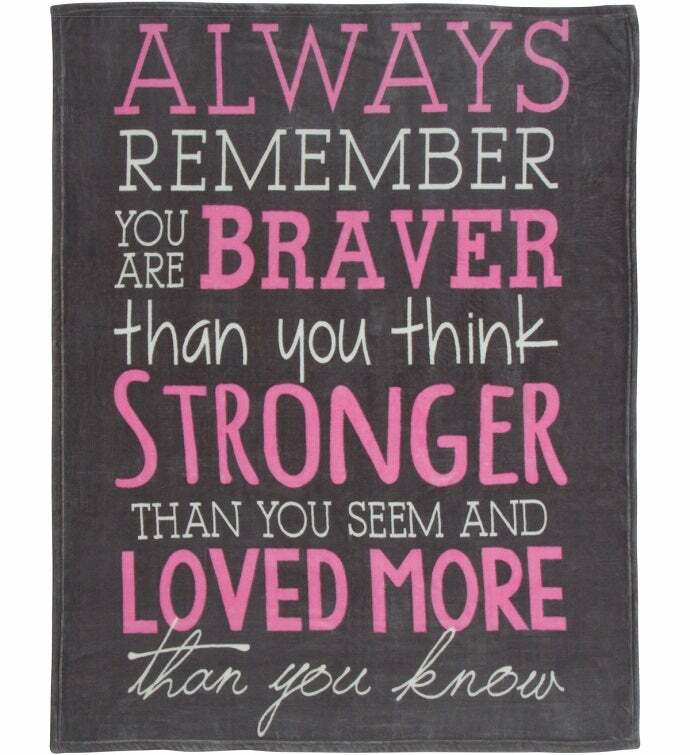 GIVING BACK: For every Always Remember You Are Braver blanket purchased at regular price, the manufacturer will gladly donate one blanket to a woman in need of comfort and encouragement. 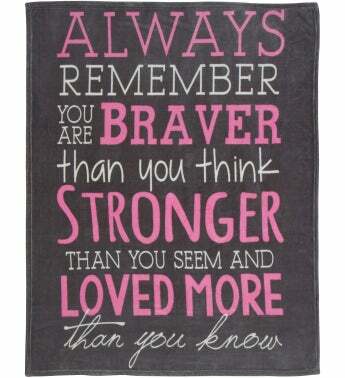 Remember You Are Braver Throw Blanket.